So I'm going to be honest with you, as much as I love to pair great wines with delicious meals, I get pretty jazzed about a wine that I can crack open at the end of a very long day and just relax with. These wines have to be full of great flavor, they normally need to be light to medium in body so I don't fill up on them too fast, and I like limited tannin in a sipping wine. I also want them to be economical. Rarely do I want to crack open an expensive bottle of wine on a random Tuesday night, however, and here's the trick- I want to FEEL like I'm treating myself to that amazing bottle just because. I want there to be depth to the wine, and complex flavors. The other day I was browsing at The Wild Duck in the North End and I found the perfect bottle. 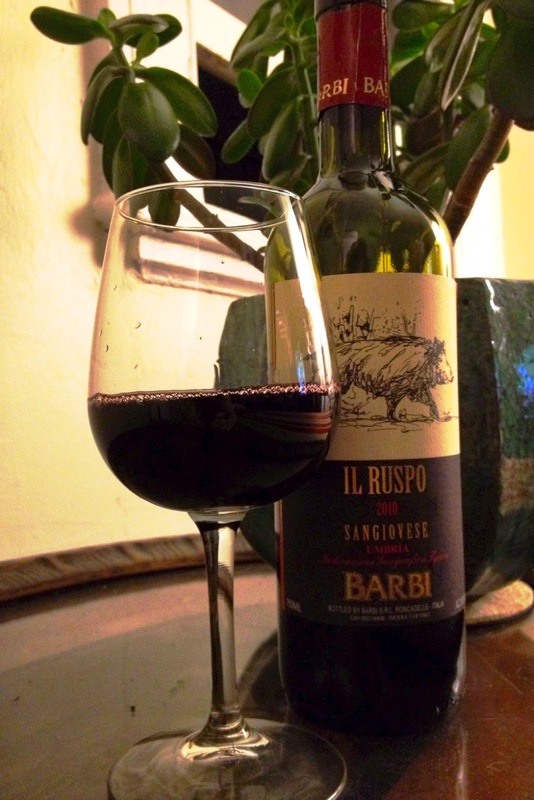 Il Ruspo Barbi 2010 Sangiovese. This bottle rang in well below the $20 mark, as I recall closer to $13, and presented with a medium garnet rim blending to a ruby core. An incredibly clean nose, medium intensity and scented with black fruits, eucalyptus, and the slightest hint of chocolate. The palate fell right in with what I anticipated, medium to medium plus acid, gentle tannins, light in body, and bold flavors. Similar to the nose, I got tastes of bright, fresh sour cherry, and then baked plums and black berries mixing with a subtle feel of chocolate or mocha and a hint of herbal and eucalyptus again. Gorgeous wine. A medium length finish made this a very nicely balanced wine, and a great representation of what slightly aged Sangiovese can be. I can't say that I'd age this one much longer, the body and tannin can't hold it for too much longer but right now, this is a gorgeous wine. It's a perfect sipper on a chilly night to keep you warm and chase those bad day blues away. Of course just as easily it would pair with a heaping bowl of pasta smothered in red sauce, or in a wine reduction sauce to marry together pork and vegetables. This is a good one folks- drink like a prince at a paupers price.